Message 569653 - Posted: 17 May 2007, 17:11:30 UTC - in response to Message 569633. Hi Eric, Thanks for the information. I just want to confirm something. . .
. . . Only penguin is on download duty, but that may change if downloads start becoming a problem. . .
Are downloads indeed going out at all now? I've received none for about two days on any of my eight workstations. Also, while uploads are going we are unable to Report any of them. Please note unusual verbage (Message from Server: Incomplete request received.) in the following exchange. This seems to be common to many per the message threads. 5/17/2007 12:48:30 PM|SETI@home|Message from server: Incomplete request received. I'm not trying to bust your chops, I KNOW how hard you are all rowing trying to fix this monster. I'm just looking for information and to be sure you are aware how many problems remain. Best regards, and thanks for the hard work. Message 569675 - Posted: 17 May 2007, 17:47:45 UTC - in response to Message 569653. As you say, many people have reported this - yet others say things are working normally. I have two older hosts/older clients (v5.3.12.tx36) which have been trying to report at intervals all day. Sometimes they failed to contact the scheduler at all, sometimes they got the 'Incomplete request received' response. Since Eric mentioned that the scheduler has been moved, I thought I'd give them a prod. 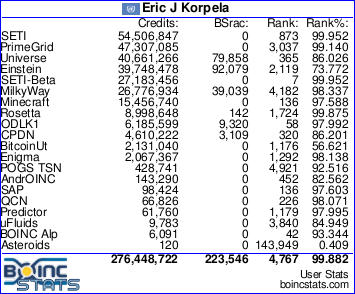 Just did an 'Exit BOINC - start BOINC' sequence, and both have now reported. Coincidence or.....? Message 569685 - Posted: 17 May 2007, 17:59:22 UTC - in response to Message 569675. That's a good thought, when in doubt reboot or restart. I just tried it on two of my closest hosts but they did not report. This is all most likely just the luck of the draw plus an artifact of incredible network traffic, but thought Eric may be able to offer a different perspective. Update. Two of my more remote hosts have now reported. We're making progress it seems. I see that my caches had emptied overnight of all finished results, a few got awarded credits but most are "pendings"- more than two daysworth. Besides, I see no new work and have only five hours before two of my four cores run out of Einstein work. I guess I'll have to fetch about a daysworth more of Einstein; otherwise my two machines will be absolutely idle. Congratulations and thanks to the team (and anyone else helping) for doing its best in coping with all these problems and solving some of them. Several of us have tested and confirmed an issue where we contact the scheduler and get an HTTP Internal Server Error and it causes our hosts to be assigned a result, but the result never comes to us. I would guess that this is causing other people to get "No work from project" messages, as the system thinks that everything has been sent out???? If you want to read the discussion on it, please see the thread in Number Crunching called Ghost WU issue (and some talk about deadlines) from that post I pointed you at and on upwards. The prior discussion was me musing about deadline extensions and is not nearly as important as addressing this. Message 569766 - Posted: 17 May 2007, 20:33:14 UTC - in response to Message 569633. Only penguin is on download duty, but that may change if downloads start becoming a problem. That would be now. Nothing is downloading, even though the account information on the server says that it has. Message 569768 - Posted: 17 May 2007, 20:41:31 UTC - in response to Message 569766. Do you mean you have tasks shown on the 'Transfers' tab in BOINC Manager, trying but failing to download? If so, then we need an additional download server. Or do you mean you see tasks in the 'Results for computer' on this web site, but nothing in BOINC Manager? We call those "Ghost WUs" - different problem, different solution. Message 569782 - Posted: 17 May 2007, 21:12:02 UTC - in response to Message 569768. Message 569788 - Posted: 17 May 2007, 21:13:41 UTC - in response to Message 569675. Sometimes they failed to contact the scheduler at all, sometimes they got the 'Incomplete request received' response. Since Eric mentioned that the scheduler has been moved, I thought I'd give them a prod. A simple exit boincmgr, start boincmgr gave first trial success on two of my three repeat offending machines. The third was not healed by that, but was healed by a full power off reboot. When I checked that host under My Computers on the web site, I see that all 36 were indeed reported at that time even though they still show up in BOINC as "Ready to Report". The system also claims to have sent two ghost work units at the same time which never arrived. Anyway, things are still very broken. Just my 2c. I still have this "Stand By" box offline.....If you think more H/W is the answer I can Overnight-it. U have my number. Message 569922 - Posted: 18 May 2007, 0:48:16 UTC - in response to Message 568867. I got manu WU's, too. Unfortunately they were all ghosts. They upload queue is gone, though. Message 569985 - Posted: 18 May 2007, 2:19:19 UTC - in response to Message 569922. 5/17/2007 8:16:02 PM||Access to reference site succeeded - project servers may be temporarily down. Message 570083 - Posted: 18 May 2007, 5:52:03 UTC - in response to Message 569985. It's still pretty hit and miss (as you can see). Hopefully it's getting toward more hit than miss at this point. Ptolemy lost connectivity to the upload directories on bruno for a while. Just fixed that, so our upload rate should double. This Graph is still your best bet of checking your chances of getting through. The higher the graph is, the better. But we should be hovering around 22 Mbps rather than 15. We're still operating on a single scheduler due to compile problems. G'nite. I'll catch up on where we are in the morning. Message 570151 - Posted: 18 May 2007, 10:14:44 UTC - in response to Message 570083. Eric, just to add to what others have said, none of my ten workstations are able to upload/download, and are returning the same messages, "Schedular Request Failed: Server returned nothing (No headers, no data)" and then they return the " Message from Server: Incomplete request recieved" message. It would appear from my stats that some of the machines managed some form of uload in the previous 36 hours, although the quantity uploaded is dwarfed by those in the upload queues and the rate of completing units is outstripping the exchanges that are taking place. Currently I have about 150 completed units in my queues and about 2 days of total crunch time left, and that is moving units from one machine to another to ensure they stay cruching! Zeus, my main workstation is now running Einstein again as it's 8 cores ran out of seti units yesterday, it has about 60 units in it's upload queue and has not connected in about 10 days, currently it is trying to recieve some 3,815,477 seconds of new work, but gets dropped constantly. If it were not for the sheer cost of transport, I would send you Zeus as an upload server, it is a DELL quad 3.2GHz HT Xeon machine Running with 4GB of Registered DDRII at the moment and Ubuntu 4.07. I have just sourced some DDRII (unbuffered or registered) to put into it (10GB). However a check on the shipping cost from London to you was more than Â£1000 unless it went by ship and would not arrive with you for 8 to 9 weeks!! Hopefully all the glitches will be sorted soon and we will be back to as normal as things ever are. A lot of people are reporting incomplete scheduler requests (with various error messages) and the creation of a lot of 'ghost' results - potentially storing up another batch of problems in the future when the 'ghost' deadlines expire. I don't know why this works - one user has speculated about app_info processing overhead, I'm wondering about the BOINC v5.10 <platform> tag - but it seems consistent and reproducible, so it may help to narrow down the debug search. Message 570284 - Posted: 18 May 2007, 13:45:53 UTC - in response to Message 570200. I've tried this workaround on my MacIntel; G5 and XP laptop and it has worked in each case! Added to that I have solved my caching issue so I've loaded a nine queue of WU's. Now I can switch back to the optimized app. Thanks for the interim solution! Message 570285 - Posted: 18 May 2007, 13:46:51 UTC - in response to Message 570151. Could you give me an IP address for this machine? I'd like to scan the logs to see what's going on on this side. Message 570297 - Posted: 18 May 2007, 14:03:29 UTC - in response to Message 570285. SETI@home	17/05/2007 18:18:18	Message from server: Incomplete request received. Times have been adjusted to UTC - should be pretty exact. Hope that gives you something to look for while you're waiting for Jim to post. Now new wu's pooring in. The above mentioned workaround works.